Most producers of medical cannabis do not have the capital, nor the expertise to operate a Gas Chromatography (GC) or High Pressure Liquid Chromatography (HPLC) machine to test the potency of their marijuana. 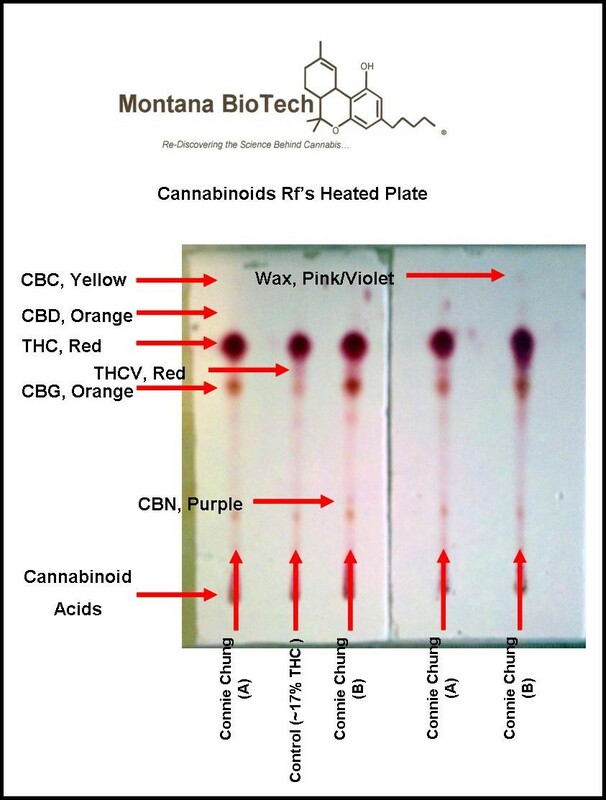 Thin Layer Chromatography (TLC) can be preformed at home, for a nominal cost, and provide a grower, provider, closet tinkerer or professional breeder of cannabis the opportunity to qualitatively analyze for cannabinoids, FAST, and reproducibly harvest to harvest. TLC was the method of choice for this study as it provides a means of rapidly and visually analyzing a number of samples simultaneously. Unlike the comparison of two samples in order to assess whether they are the same (or different), when quantitative analysis is essential, assessment of origin is qualitative, since the sample under study and the reference samples are, in fact, different. There is thus little point in using more powerful techniques such as high-performance liquid chromatography as the quantitative information provided is likely to confuse the picture. 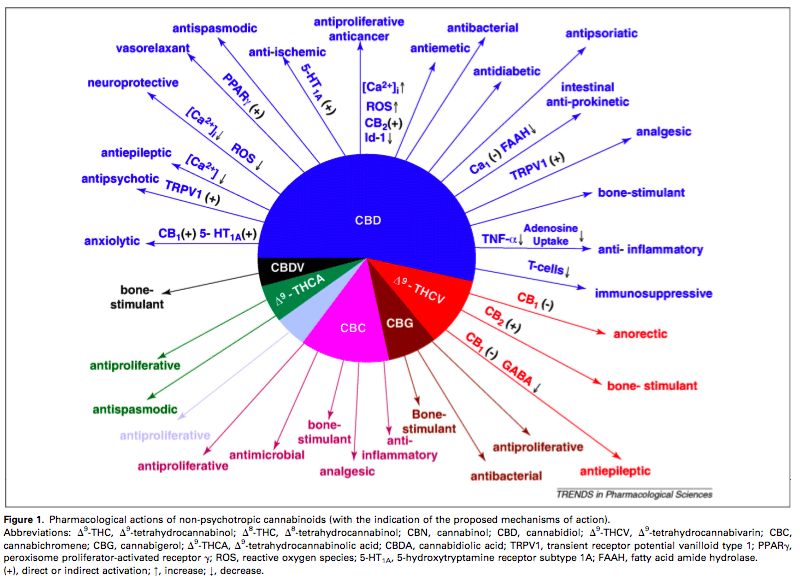 The TLC system was designed to give information on the cannabivarins in addition to the more commonly studied cannabinoids. 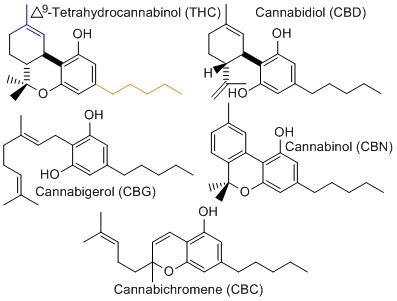 The principal cannabinoids observed using this system are given in table 2. For the month of September if you buy 1 Grow Buddy™ you will receive a second Grow Buddy for FREE!! Or, You can get 2 Grow Buddy‘s for the price of 1!!! Anyway you look at it, it’s a savings!! 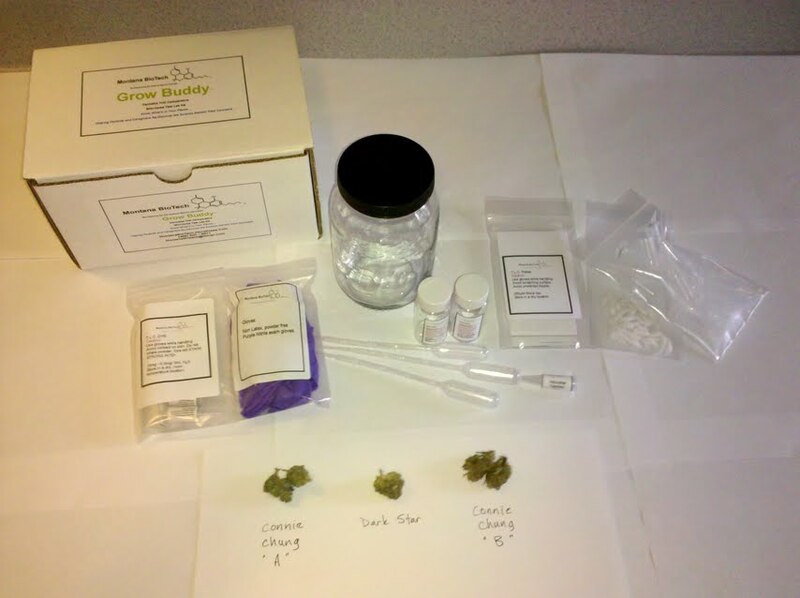 Grow Buddy™ is a thin layer chromatography ( TLC ) kit that YOU can use, at home, to analyze your cannabis for THC, CBD and other cannabinoids and determine a less than, equal to, or greater than value based on an internal control ( known quantity of THC )! Say for instance, you have a cannabis sample and you do not know the THC content. Let us assume you have a control you know the given THC percent dry weight for. If you ran your unknown sample against your known control you can get a pretty close assessment of the unknown’s value. In this capacity, Grow Buddy™ can be used to keep track of changes in THC content or CBD percent dry weight, harvest to harvest! Better yet, do you plan on increasing the CBD in a strain you have, the Grow Buddy will help ascertain differences you could miss the old fashion way of testing, pack and smoke, from cross to cross. Here’s how the Grow Buddy can help a grower even further; find NOVEL cannabinoids in your cannabis not seen in others! THCV is a little understood cannabinoid that packs a PUNCH! CBC is a curious cannabinoid very few talk about, use the Grow Buddy to SEE if your cannabis is doing more than just getting you stoned! Grow Buddy™ is a T.L.C. based method for analyzing cannabis for the presence of THC, CBD, CBN that ANYONE can perform at home! The Test is quick and fun! 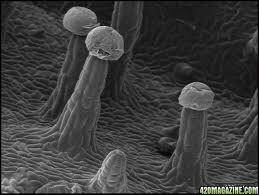 if you have brewed beer, wine, if you consider your self a “good” cook, you can perform a TLC test for THC, CBD, CBN. Grow Buddy™ is designed to give maximum results with the minimum of effort. The Grow Buddy™ system is a comparative test made to facilitate the grower, patient, caregiver, or connoisseur to be able to test for cannabinoids at home! Grow Buddy™ was created around a T.L.C. method to help ensure ease of use for ALL ability levels. If you are a patient, you now how hard it is to nail down exactly what strains are best for what, or how to even find the information you need to make those educated decisions. Find a variety/strain YOU like for YOUR condition, test it at home, if it is not already tested, and know what to look for in YOUR medication. Green Crack means very little to a patient who has not used cannabis in their adult lives, but Grow Buddy™ can help that patient know why they like Green Crack for what ails them. Find/discover varieties or strains that have novel combinations of cannabinoids! Compare relative levels of THC, CBD, CBN, CBC in varieties or strains you know and trust! Grow Buddy™ will provide an individual the opportunity to select amongst their strains “THE ONE” best suited for further analytical testing by a lab you know and trust. 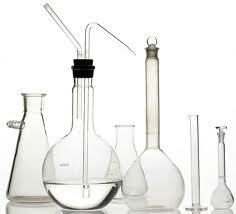 Keep the accuracy of the ever increasing number of potency analysis labs in check! 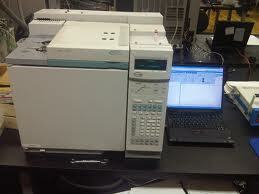 Have an idea of what you have before you spend the TIME and MONEY to get it tested in a lab. Grow Buddy™ is backed by a potency testing lab with experience in the field of cannabis quality testing. Montana Biotech’s Grow Buddy™ is intended for anyone ready to take their medicine to the next level!